Apple’s flagship iPhone X 64GB is available at Rs 79,999. Amazon is offering Rs 9000 discount from the original price of Rs 89,000. The iPhone X 256GB is priced at Rs 97,999 (original price Rs 1,08,930). In addition, customers can avail an instant discount of Rs 5,000 by making their purchase using an HDFC Bank debit or credit card. EMI options for the phone start as low as Rs 3,803 per month. Also, there is an exchange discount of up to Rs 15,900 that can be availed in lieu of an old smartphone. Amazon Sale is offering larger screen iPhone 8 Plus 64GB version for Rs 65,999 (original price Rs 73,000). The iPhone 8 Plus 256GB storage version is now available at Rs 79,999 (original price Rs 86,000). The iPhone 8 Plus is available in both Space Grey and Gold colour variants. The iPhone 8 64GB version receives a discount of Rs 9,001 and is available at Rs 54,999 (original price Rs 64000). However, this discount is for the Gold colour variant only. The iPhone 8 64GB Silver is available at Rs 55,999, and iPhone 8 64GB Space Grey goes for Rs 57,999. Meanwhile, iPhone 8 256GB all color options are available at Rs 68,999 (original price Rs 77,000). In addition to these discounts, all iPhone 8 and 8 Plus models get an instant discount of Rs 3000 on use of HDFC Bank credit and debit cards. The iPhone 7 Plus 32GB is now available at Rs 56,999 (original price Rs 59,000) and the iPhone 7 Plus 128GB at Rs 64,999 (original price Rs 68,000). The iPhone 7 32GB goes at Rs 41,999 (original price Rs 49,000), iPhone 7 128GB at Rs 54,999 (original price Rs 58,000) and iPhone 7 256GB at Rs 58,350 (original price Rs 74,400). 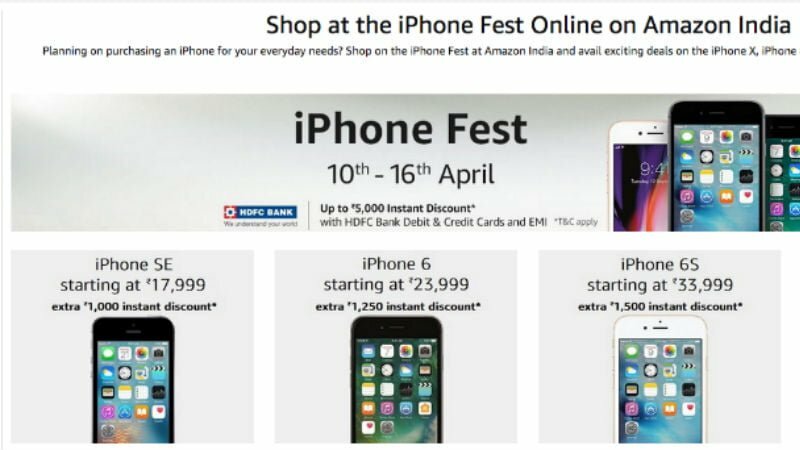 Amazon is also offering Rs 2,000 of instant discount on all iPhone 7 and iPhone 7 Plus purchases through HDFC Bank debit and credit cards. The iPhone 6S 32GB is available at Rs 33,999 (original price Rs 40,000) and the iPhone 6S Plus 32GB at Rs 37,999 (original price Rs 49,000). The iPhone 6S is eligible for Rs 1,500 of instant discount via HDFC Bank while customers buying the iPhone 6S Plus can get an instant discount of Rs 2,000. As for the older iPhone 6 32GB is available at Rs 23,999 (original price Rs 29,500) that can be purchased with an instant discount of Rs 1,250. The cheapest iPhone available via the Amazon sale offer is the iPhone SE 32GB which is available at Rs 17,999 (original price Rs 26,000). It also gets an instant discount of Rs 1000.